The biggest chunk of competition in the mattress industry is arguably divided between memory foam mattresses and innersprings. Memory foam mattresses have a lot of marketability, given they are made from technology that was first employed in providing proper and adequate rest to astronauts. Innerspring mattresses of the other hand have been around for decades now, which means they are seen as the safer option. People researching online often get stuck on these two as well. The competitive pricing doesn’t help decide either. And not everyone knows everything about both, so i thought i should write a post to help you compare between the two. So here goes. 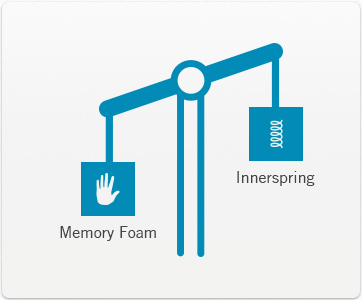 What sets Innerspring and Memory foam mattresses apart from the rest? The two mattress types aren’t really poles apart. They do have some similarities, and share a lot of benefits. In fact, that makes a lot of people buy innerspring mattresses and use a memory foam topper with it to get the best of both worlds. Let’s see what’s great about these two, and what they have that other sorts of mattresses just cannot hope to offer. The two mattresses have a steady tautness. Laying on a pocket coil mattress and a memory foam mattress is similar in terms of the way the bed hugs your contours, which is essential in providing proper spinal support. Both mattresses are easier to clean than several other types on mattresses, like organic mattresses, latex mattresses and others. Both of these can come significantly cheaper than other types, while maintaining a competitive quality standard. With all of that said, there is certainly more to them than their similarities. There are several ways the two differ from each other, which is what can help you decide between the two. 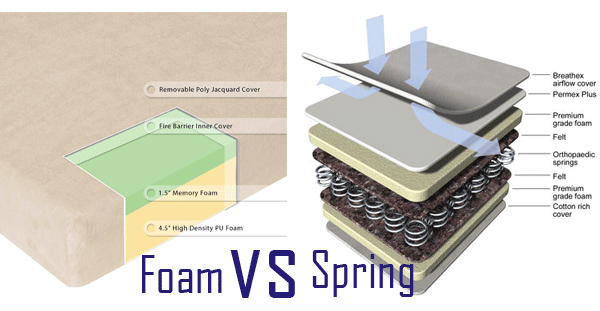 How Innerspring and Memory Foam mattresses differ? Having noted how Innerspring and Memory Foam mattresses are better than most mattresses of other variants the market has to offer, it is crucial to say they are not the same thing. Each has unique features and benefits to itself. Let’s see what they are, one by one. The traditional innerspring mattress consists of coils of spring sandwiched in two meshes of metal wire, covered on all sides with soft fluffy material like foam. Recent mattress makes, however, have reinvented the spring mattress in the style of air mattresses, taking a cue from their columnar support. This latest innerspring design is called pocket spring, since each spring is individually encased in a pocket of fabric. The hard wire meshes are gone too, and most pocket springs now have foams of varying densities on top. 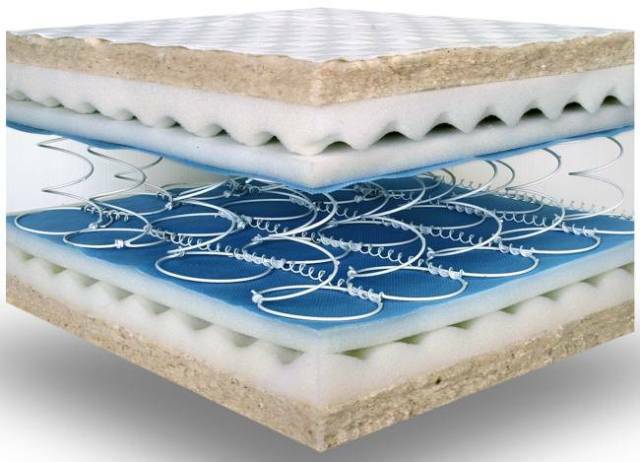 Innerspring mattresses are often observed retaining their elasticity for longer than most foam based mattresses. You can get a mattress which uses both stiffer and softer springs, to get a proper balance of support (due to the former) and hug (due to the latter). One amazing feature of pocket spring mattresses specifically is how flat they can be next to a compression. Since the springs compress individually and not according to the net weight, the surface next is not that affected by the load. So you’re less likely to be bothered if your co-sleeper shifts in bed at night. Do keep in mind that a good innerspring mattress usually has between 1000 to 1500 springs. Anything higher is usually a marketing gimmick where smaller springs are incorporated to increase the count, even though they serve no real purpose. Yes, Memory Foam was indeed used to help astronauts sleep. Now that that’s out on the way, let’s talk about what you’ll get when you get a memory foam mattress. Memory Foam mattresses have been designed to get you a proper hug which not just gets you support but also makes the mattress feel plush. Even as the mattress does that, you can find different sorts of memory foams. High density memory foam gets you support, and low density helps in the hug and comfort. Many models employ both. A lot of memory foam mattresses also come with cooling gels that serve to aid in keeping heat away from your body for a comfortable rest. Memory foam mattresses are comfortable because they have suppresses elasticity, if you will. They don’t immediately retract to their flat state when you switch positions, which serves to keep people a lot more comfortable when they do. The bed’s plushness is enhanced several degrees this way. Which of the two to choose? There is no rule of thumb that guarantees either of the two to be better than the other. Different users can feel differently. Some prefer Innerspring mattresses’ bounce and comfort, while others like Memory Foam for their superior edge support. Both can serve to get you a good night’s rest. And like many, you can always get a memory foam topper for an innerspring mattress.